In the framework of “Advancing Human Rights of LGBTI Refugees in Turkey” project, Kaos GL Association is planning to meet over 300 refugees in 7 provinces. The Project team informed us about the “Advancing Human Rights of LGBTI Refugees in Turkey” Project which will be conducted by Kaos GL together with The United Nations Refugee Agency (UNHCR). Kaos GL working on the rights of refugees since 2007 aims both to strengthen the community and to advance the human rights of refugees living in Turkey with the legal and social consultancy, national and international awareness-raising and trainings for LGBTI refugees in the scope of the Project. Project Assistant Sengül Kılınç stated that the aim of the project is to address the obstacles LGBTI refugees face in accessing the legal rights and the violations of human rights. She added that at the same time they expect to raise awareness in national and international level for LGBTI refugees in Turkey, and plan to strengthen refugeee community through the trainings and social activities which will be carried out during the project. In the framework of this project, it is planned to visit 7 pilot provinces and to make face-to-face interviews with 300 refugees there. In this respect, Kılınç stated that those provinces were chosen from the ones where LGBTI refugees are concentrated: Denizli, Eskişehir, Yalova, Burdur, Isparta, Kayseri and Adana. Kılınç said that the trainings in the scope of the project will focus on the topics like accessing the rights and services, health, social services, social aid and right to work. By this means, she stated that they aim to provide safety of the refugees during the period when they are waiting for relocation to a third country. Social work expert of the project, Koray Arkadaş, emphasized the multiple discrimination refugees are exposed to, and he stated that thanks to the project they aim to provide their access to basic rights and social networks in the places where they reside. He also added that in the framework of the project they will to those 300 refugees about the reasons why they came to Turkey and about the discrimination they faced since they came to Turkey. The project team will organize 8 trainings in Denizli in May, in Yalova and İstanbul in June, and in Eskişehir in July. Those trainings will be about the rights and obligations of the LGBTI refugees in the Turkish legal system, sexual health and the gender transition process. In addition, a football match, refereed by Halil İbrahim Dinçdağ ostracized from profession due to sexual orientation, will be organized. After the match planned to be organized with participation of approximately 50 participants, a dinner will be organized as well. Arkadaş stated that field researches and trainings will be evaluated by project team together with trainers and activists from Pembe Hayat in August, and data collected from field researches will be sorted. The final sitting of the project will be carried out with the participation of the project team and Kaos GL financial coordinator in December. 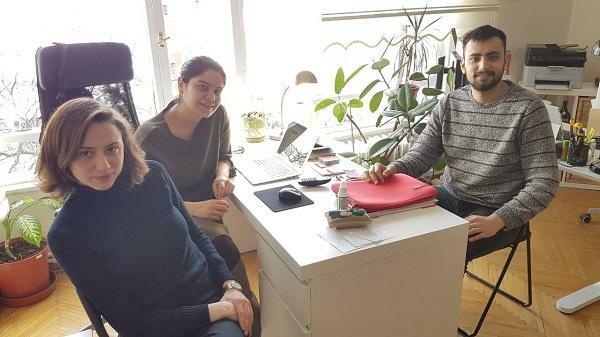 Social work expert Arkadaş also added that all of the activities will be reported. Finally, we talked to Project Coordinator and Lawyer Hayriye Kara about the legal situation in Turkey and its effects on LGBTI refugees. Kara reminded that there is no obvious discriminatory legislation in Turkey except Turkish Armed Forces legislation and Penal Enforcement Act, but the expressions such as ‘public morality’, ‘obscenity’ and ‘Turkish family structure’ can be used to restrict the fundamental rights of LGBTIs. She added that there is also no legal regulations aiming to struggle against the discrimination and hate based on sexual orientation and gender identity. As a result, judges and government officials in Turkey are actively using the vague articles to cause discriminative results against LGBTIs, and they accuse LGBTIs rather than considering the advises of organizations monitoring the international treaties. Therefore, LGBTI refugees are exposed to multiple discrimination because of this concrete situation in Turkey and their refugee status. Lastly, Hayriye Kara said that they hope to shed light on the discriminations which LGBTI refugees face in their daily lives, and to facilitate access to basic rights, official organs and social networks in the cities where they reside.